(San Diego, CA) – In this day and age of ultra-rare beers, it’s become commonplace for consumers to encounter bottles coming in far above the price-tag of everyday ales and lagers. Some of these higher-end creations come in at $20, $30 or even a budget-breaking $40 each. Not to be outdone, the capitalist masterminds at San Diego’s Societe Brewing Company are about to release their most cost-prohibitive offering to-date: The Urchin. Aged in red-wine barrels hailing from California vintners, rested on pristine cranberries from the bogs of New England, then blended to perfection and siphoned into 500-milliliter bottles, this exquisite, extremely limited quaff can be had for a whopping $50 per bottle…or a mere $5 for those who help out needy San Diego families via Societe’s annual holiday food-drive. As illustrated by the semi-algebraic infographic below, donating 50 pounds of food to the Societe Holiday Food-Drive between November 21 and December 31 will entitle said donor to purchase a bottle of The Urchin at the discounted price of $5. More importantly, it will result in improved quality of life for those who benefit from the donation as well as happiness and fulfillment that go far beyond beer. While delivering 50 pounds of the above items will earn the discounted bottle of The Urchin, donations of all sizes and quantities are very much appreciated. Anyone who donates items from the most-needed list at our tasting room will receive $1 off each full beer purchased on the day of delivery. 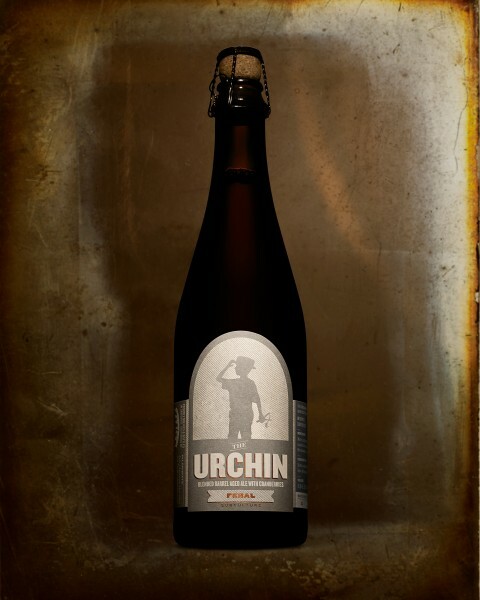 The newest in Societe’s line of “Feral” (barrel-aged sour) beers, The Urchin is a dry, extremely balanced beer, exhibiting subtle cranberry tartness leveled out by tannins extracted from the wood of the wine barrels in which it matured. The deep crimson ale is light on the palate and finishes with a touch of tinder-box spice. Incentives: Donating 50 lbs of food entitles donor to purchase a bottle of rare-beer, The Urchin, for discounted price of $5 (normal price: $50/bottle). Any food donation entitles donor to $1 off all full-beer purchases on date of donation. History: This is Societe’s fourth year of partnering with Jacobs & Cushman San Diego Food Bank. In 2015, Societe’s drive resulted in the collection of 4,972 pounds of food. About Societe Brewing: A production brewery founded by a pair of professional brewers in 2012, Societe Brewing Company produces an array of almost-exclusively draught offerings ranging from hoppy “Out West” ales, to Belgian-inspired and continental “Old World” ales and lagers, and dark “Stygian” ales. The brewery also features a 1,500-square-foot barrel room housing a maturing stock of “Feral” barrel-aged sour ales. Proud to be part of the hotbed of brewing innovation that is San Diego, California, Societe distributes its beers to finer bars and beer-centric restaurants and retailers throughout its home-county, with limited distribution in Central and Northern California. The brewery has earned medals in multiple style-categories at the Great American Beer Festival and World Beer Cup competitions, and its multifarious portfolio of year-round beer includes The Pupil and The Apprentice IPAs, The Coachman Really Small IPA, The Harlot Belgian Extra, The Pugilist Dry Stout and The Butcher Imperial Stout.